This is the view from Montana del Mar. Please use the scroll bar at the bottom of your window to see the entire photo. Photo of Montana del Mar from below. View from the street, each unit has its own parking area. Montana del Mar is a community of eight unique homes in La Manzanilla, Jalisco, Mexico. 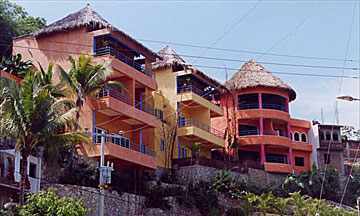 Each palapa-roofed home has two bedrooms, two and one half baths, living/ dining room and kitchen. 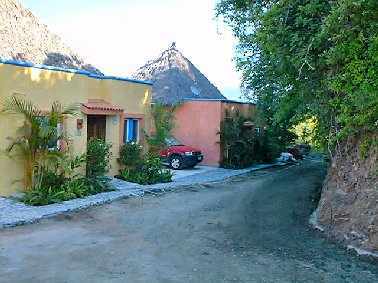 Six of the homes are located on the hill and have magnificent views of both the beach and the jungle. Terraces are cantilevered out to take full advantage of these views! And yet it is only two short blocks to the beach and to the center of town. These homes have been designed to have many "creature comforts" and yet maintain the aesthetics and charm of the "Pacific Home". One of the unique features about Montana del Mar is the fact that it has art studios as an amenity. The studios are owned by the property owners association and leased to the Montana del Mar Art Association. (More about the art studios later!) Another amenity is the swimming pool that is also a part of the common area owned by the property owners association. The pool is located on the hillside with beautiful views. Each home is located on it's own plotted lot. There is a property owners association for the ownership and operation of the common area and also for the operation of the private water system and landscape maintenance of the individual casitas. An art association is being established to provide art instruction, classes, and studio space for members. Each property owner is a member of the art association. The art association is run by a board or directors independently of the property owners association. Property owners will not be required to pay dues to the art association, but will pay for classes and instruction should they wish to attend the sessions. There is planning underway for a rentals program so those owners (who would like to rent their casitas when they are not in residence) can have a dependable and reasonable maintenance and rental administration. This is truly a development of unique homes with a wonderful setting in a delightful place!